Peaches and nectarines are quite similar and have the same cultural needs. Nectarines have smooth skin, Peaches fuzzy skin. Babcock - Medium size fruit with red blush and white flesh. Juicy, non-acid, sweet flavor. Freestone. Low chilling requirement. Ripens in June. Popular for home and commercial use. (Early/self fertile). Ultra Dwarf Patio Tree ​(image)​. California Curlfree - Known for its resistance to peach leaf curl. Fruit is similar to Redhaven. Good for canning and freezing and eating fresh. Ripens just ahead of Redhaven. Featured in February 1989 issue of Sunset Magazine. Desert Gold - Medium, round fruit. Yellow with red blush. Good quality yellow semi-clingstone flesh. Low chilling requirement. Excellent for warmer regions. Blooms early. Ripens early to mid-June. Donut - yellow skin with red blush, white flesh. Mildly sweet flavor with a hint of almond. Small to medium donut-shaped peach. Bears early, very low chill. Self-fertle. Early Elberta - The Gleason Strain is the proven outstanding variety of excellent quality in demand by commercial canners. Fruit is large, golden-yellow with oblong shape. A brighter golden color than Elberta with little or no red blush. Ripens late June to early August. Elberta - The fruits are large, freestone, colored a deep golden- yellow, blushed red with firm, yellow flesh. Famous for its outstanding shipping qualities. Long the leading major commercial variety in many areas of the U.S. An excellent pollinizer of other varieties. Ripens late July to mid-August. Fay Elberta - Fruit similar to Elberta but more colorful. Yellow freestone flesh. Colorful flowers. Most popular freestone peach for all uses. Medium to low chilling requirement. Ripens several days after Elberta. Ultra Dwarf Patio Tree (image)​. 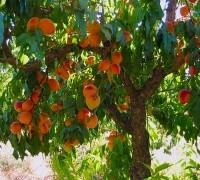 Golden Jubilee - A popular freestone peach for home canning and local markets. A large yellow peach, blushed with red. Light yellow, firm, melting flesh. Medium chilling requirement. Ripens early mid- July. (Mid-season/self-fertile). Halehaven - Medium to large fruit, red over greenish-yellow, changing to yellow at maturity. Yellow, freestone flesh very flavorful. Vigorous grower. Medium chilling requirement. Ripens mid to late July. (Mid-season/self-fertile). J.H.Hale - Fruit is very large, freestone, round and uniform. Skin is golden, covered with a brilliant red cheek. Flesh is yellow, solid and meaty, free from stringiness. One of the finest commercial and shipping peaches since 1900. 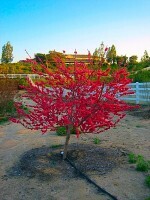 Tree requires good soil and cross pollination. Ripens late July to mid-August. June Gold - Low chilling requirement for this medium to large fruit. Skin has red blush over a golden-yellow. Juicy, delicate flavor. Ripens late May to early June. (Early/self-fertile). Red Baron - Fruit similar to Rio Oso Gem. Low chilling requirement. Fruit is firm, freestone, flavorful and juicy. Large, productive tree. Ripens mid-July. An outstanding home orchard variety with excellent flavor and a fine show of deep re flowers. Red Haven - The standard of all early peaches. 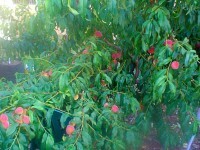 Most widely planted peach today. Color is a beautiful red and golden-yellow. Flesh is firm, smooth textured and fine flavored. Fruit is uniform, round, medium sized and appealing. Redhaven is good for canning, freezing and shipping. Fruit sets heavily and must be thinned for good fruit size. Medium chilling requirement. Ripens mid-June to early July. Reliance - An exceptionally hardy, yellow freestone peach. Has a dull blush over a greenish-yellow ground color. Medium to large size with a sweet, mild flavor. Delicious fresh, canned or frozen. Excellent for Northern climate. Rio Oso Gem - Large fruit with bright red skin. Flesh is firm, yellow, juicy and freestone. One of the best peaches for freezing. Ripens mid-August. Fruit holds well on tree. Sims - Large, yellow, cling peach. Good canning quality. Excellent for climates with mild winters. Strawberry Free - Medium fruit with pink blush. Flesh is freestone, white and firm. Low chilling requirement. Ripens mid to late May. (Early/self-fertile). (image)​. Ventura - Very low chill peach. 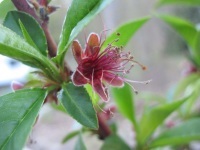 Requires very little winter chill and produces a quality fruit in very mild summer heat areas. Yellow flesh, medium size, freestone, smooth skinned peach. Veteran - A Canadian introduction with Elberta-type fruit. Fruit is round, medium sized and good quality. Above average for canning and freezing. One of the few varieties especially adapted to the coastal areas. Ripens early to late July. (Mid-season/self-fertile).